We absolutely love a good avocado in our house. Thus this Easy Avocado Sauce and Salad Dressing is a favorite option when we are serving up many of our favorite dishes. 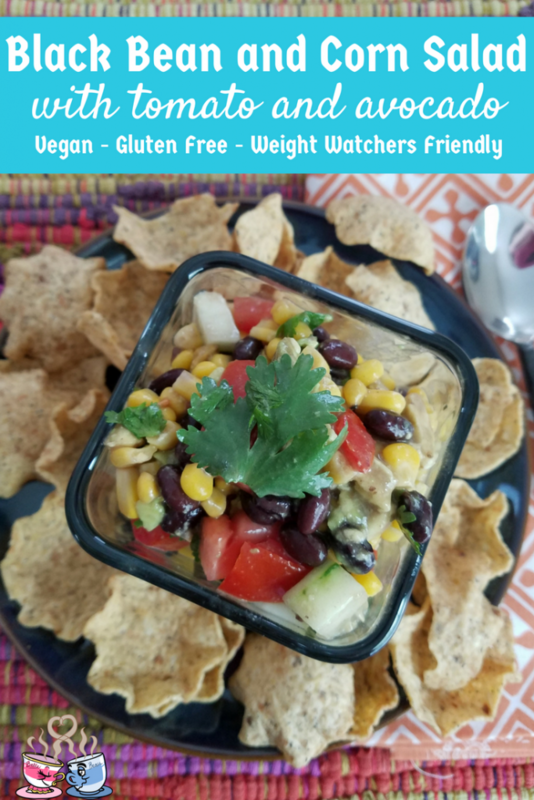 It works great alongside some grilled chicken, spinach, and tomato in a mason jar salad, or ideally over a homemade burrito bowl instead of cheese. We are sure you’ll love this recipe on your favorite dishes! This post contains affiliate links. I earn a small commision on purchases made via these links. 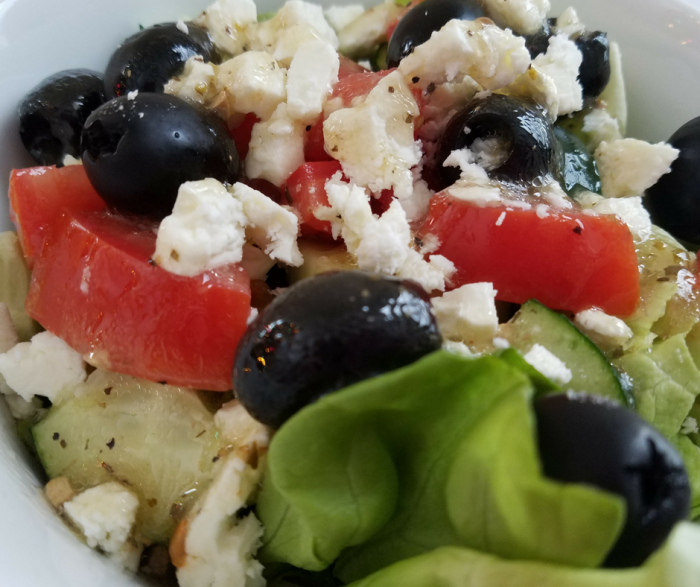 While we typically use this on a salad, I am often found drizzling over grilled chicken, tofu, or even just over rice and vegetables. Avocado is one of those healthy fats that we all need to enjoy more in our diets. On Weight Watchers, it is best to weigh the avocado using your digital kitchen scale rather than just using a measurement like 1/2 avocado, etc. This is due to the fact that avocado comes in varying sizes, and you want the most accurate value possible. 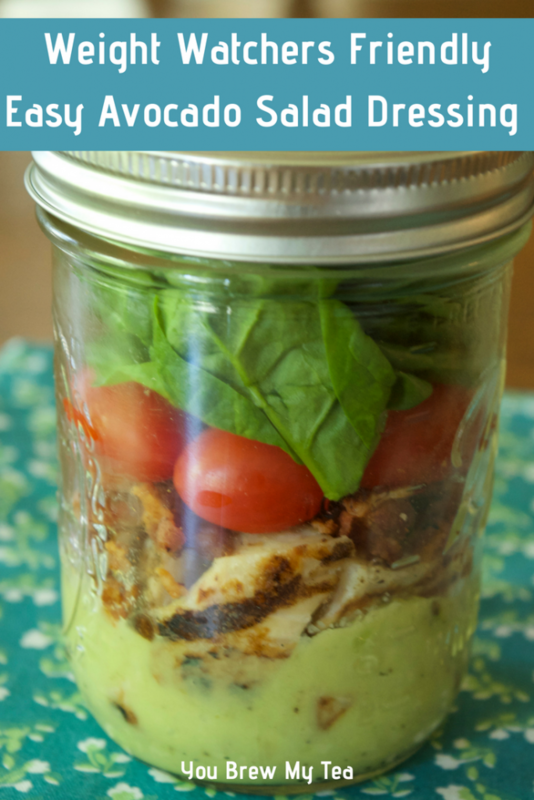 If you want to build a mason jar salad as shown in the pictures, use our great Grilled Lime Tequila Chicken Breasts as a fun addition that beautifully complements the avocado sauce recipe. Place all ingredients into blender or food processor and pulse until smooth. As you can see, it’s a super easy recipe to make. 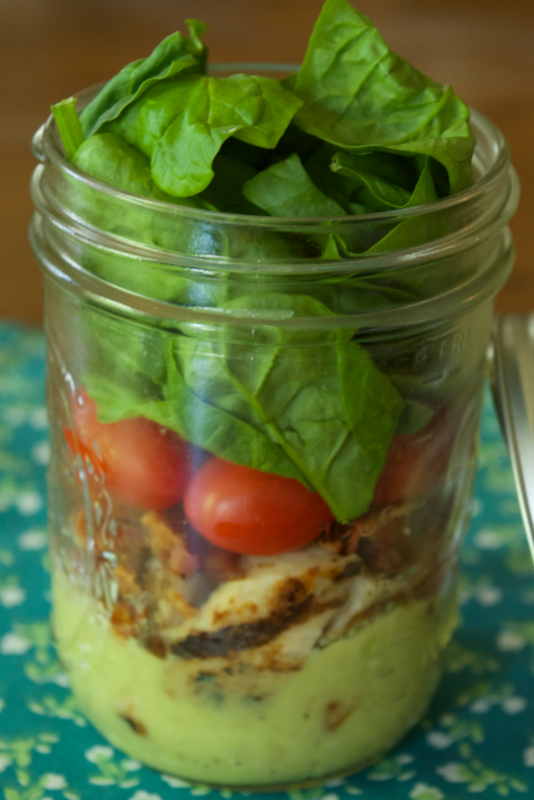 It is flexible, and delicious when served in a mason jar! 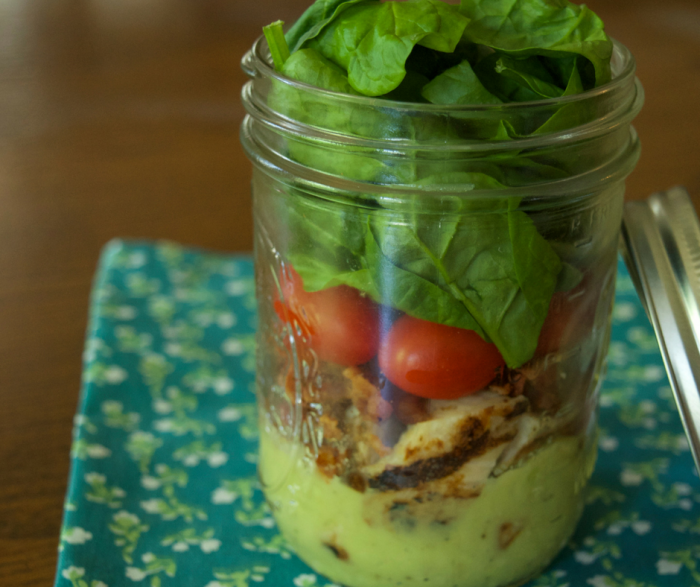 We love the combination of two tablespoons of our Avocado Sauce, grilled chicken, cherry tomatoes, and fresh baby spinach. Layer into a jar and save for the next day for lunch. It’s just so delicious! Serve this with grilled chicken, shrimp, or steak. 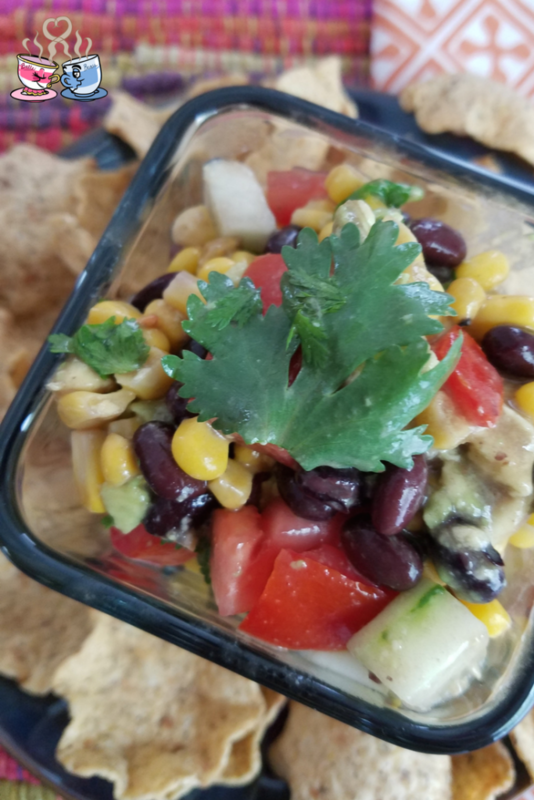 Poured over a homemade burrito bowl it adds just the cream and flavor you want without all the calories. Make for a fast go-to salad dressing that everyone loves. Making this avocado sauce is something you’ll want to do on a regular basis to share with your friends and family! 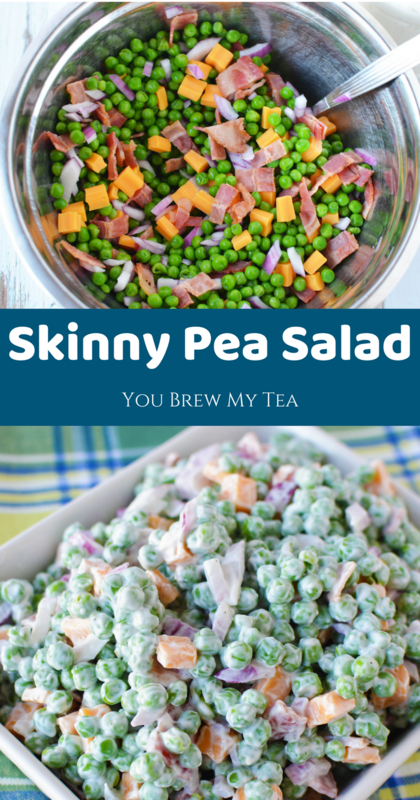 For years, I have seen a version of this Skinny Pea Salad Recipe on buffet tables at potlucks. There is just something about this that screams summer and barbecue events. Personally, I am not a big fan of peas, but my friend Kari from Craft Create Cook made this for me since I knew many of you would love it. 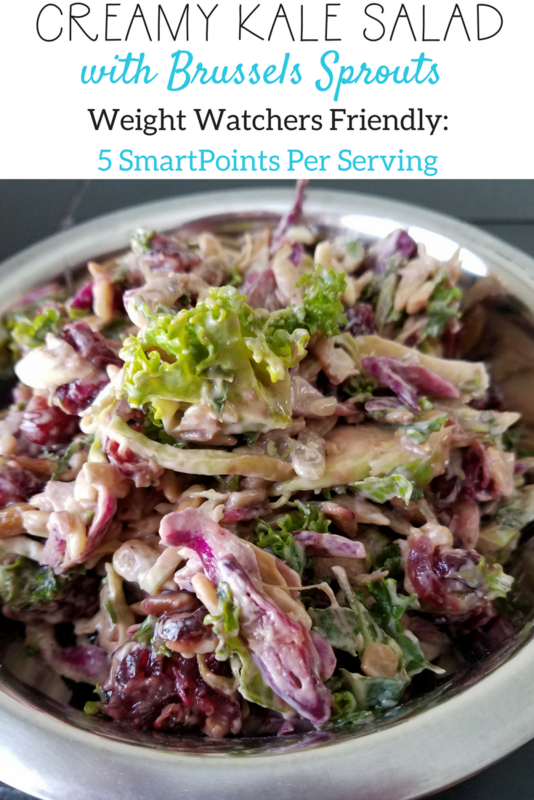 It’s a great way to create a point friendly salad that fits into any dietary plan. 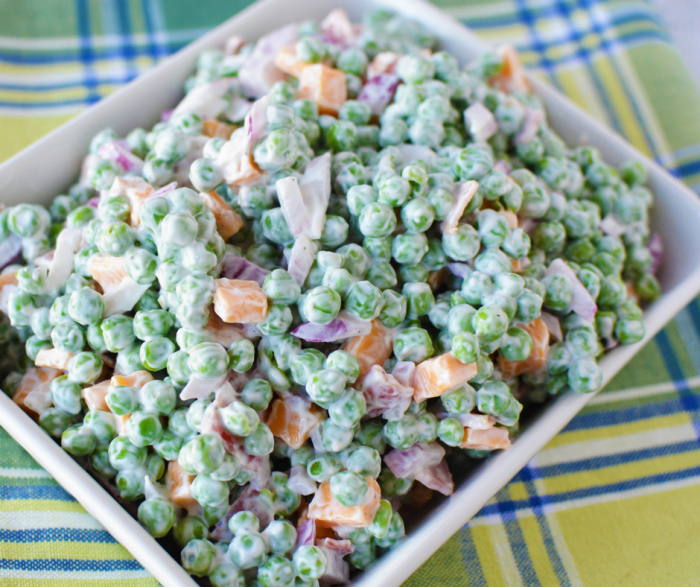 This skinny pea salad recipe is a classic that most love. Since peas are now a zero point food on Weight Watchers FreeStyle it is definitely even more popular. Using things like mayonnaise, bacon, and cheese can add points, but they are well worth it for this recipe. Recommendations: Kari shared two products that really make this easier to manage. When cutting onions, she uses an Onion Holder for Slicing. This is a great inexpensive option to help make those even cuts and keep your fingers safe. 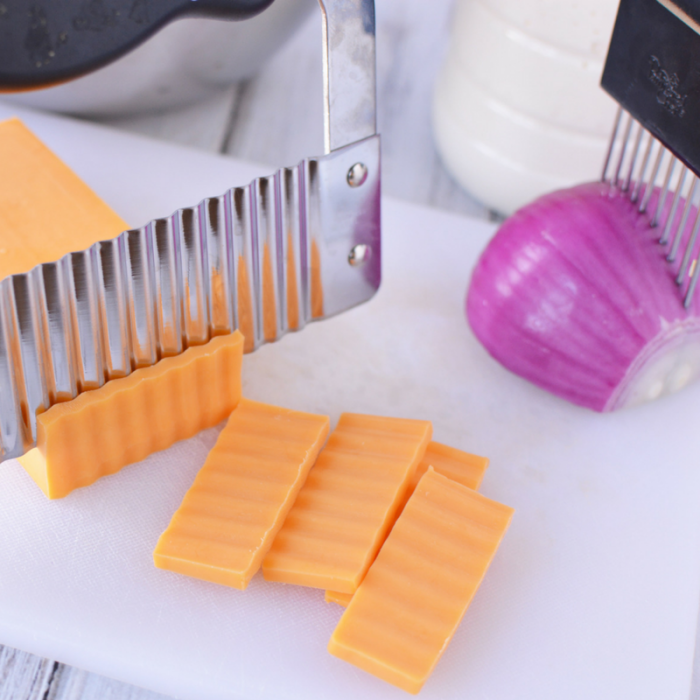 When cutting blocks of cheese for salads like this one, she uses this vegetable or cheese slicer. It makes it much easier to get even slices and takes less time. Another great option is this Pro Vegetable Chopper. 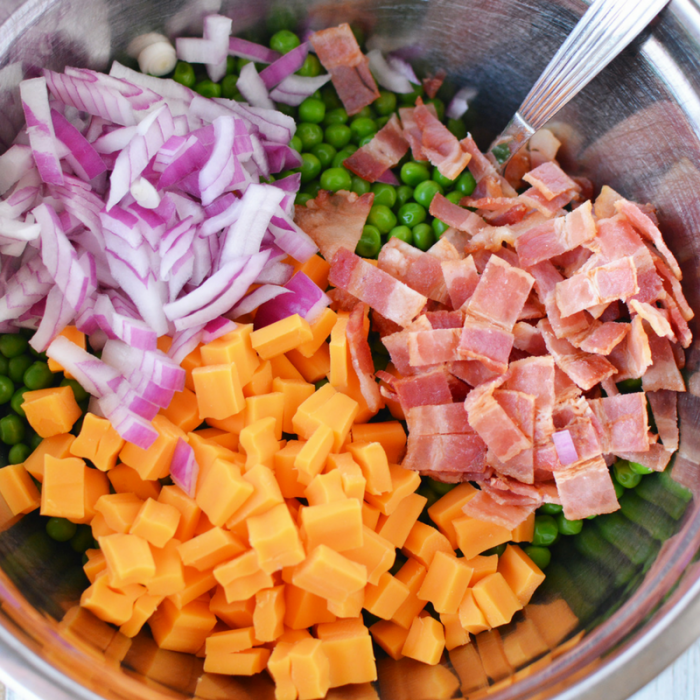 Add peas, bacon, onion, and cheese to a large mixing bowl and mix well. Add mayonnaise, sour cream and mix well. Season with salt and pepper and stir until combined. Refrigerate for 4 hours or until ready to serve. Store covered, in the refrigerator. If you want more great Weight Watchers Recipes and support, check out our Weight Watchers Support Group on Facebook! 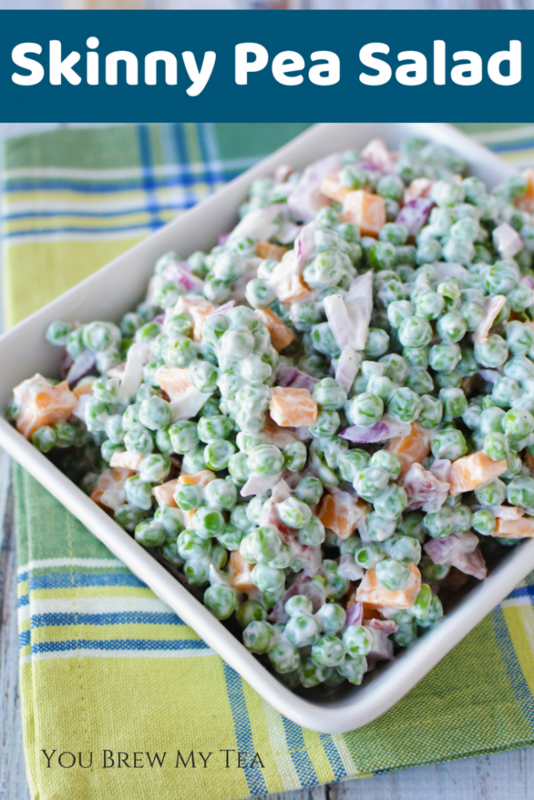 This easy skinny pea salad is a great option to go alongside your favorite grilled chicken, burger, or fish recipe this summer. If you are following the Weight Watchers FreeStyle program, then you’ll love that this is lower in points. 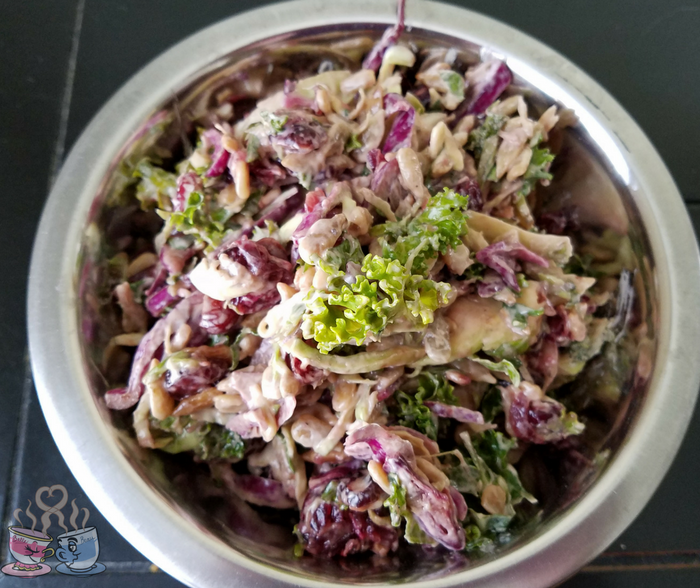 For an easy and delicious option for potlucks, barbecues, or just a side dish for Sunday dinner, grab this recipe and enjoy! 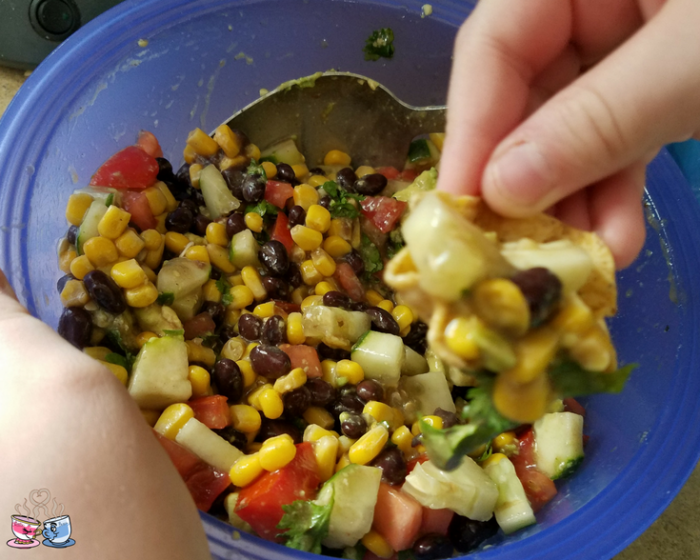 This delicious Black Bean and Corn Salad is something that was shared with me while on a retreat in Ohio with some fellow bloggers back in July. 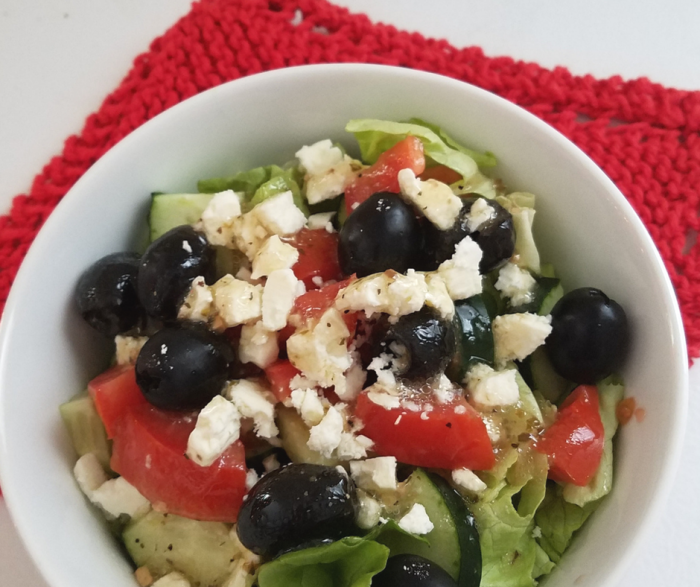 My friend Tonya, from Travel Inspired Living, made a very similar salad and shared with us. It was so tasty, I knew I wanted to make it when I got home. I changed it just a bit to make sure it was both vegan and Weight Watchers friendly. This is traditionally a salad you would make in the summer months to go alongside a barbecue. 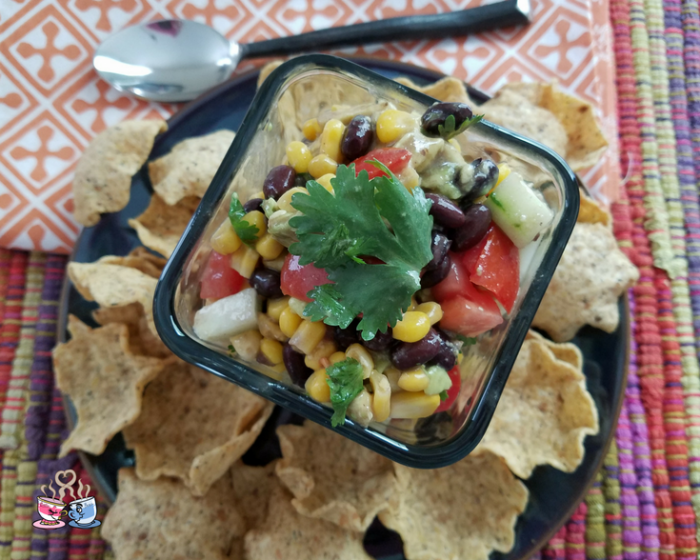 Served with chips, this black bean and corn salad is also sometimes called cowboy caviar. The version Tonya shared was a bit sweeter and to me, made a great meal without chips. Adding it to a bed of lettuce provides a wonderful meatless meal that is full of protein and flavor. Note: If you want to print this for easy reference, just click on the print option below! In a small bowl, mix together the balsamic vinegar, cumin, salt, and pepper. Set aside. Rinse canned black beans well. Pour black beans, corn, avocado, tomato, cucumber, cilantro into a large bowl. Pour in lemon juice, the balsamic vinegar and seasoning mixture, minced garlic, and olive oil. Mix well until all vegetables coated and evenly mixed. Serve over a bed of lettuce or with chips for dipping. 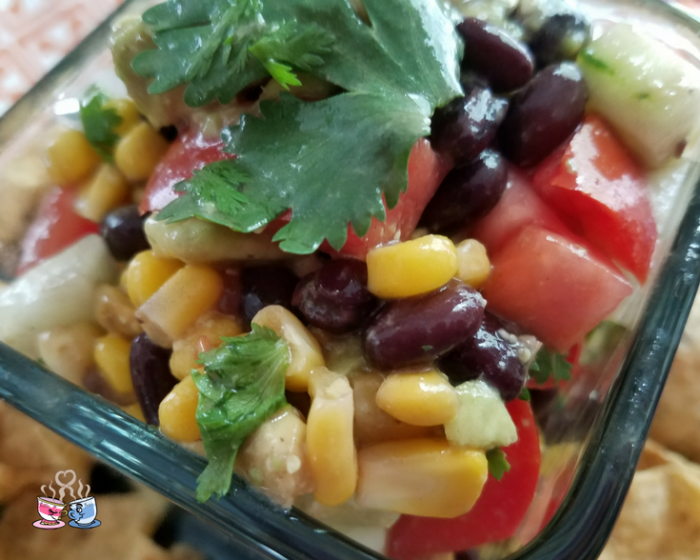 As you can see, this black bean and corn salad is a great option for an addition to a big bed of lettuce for a salad. It is also a great choice for an appetizer dip for any party. 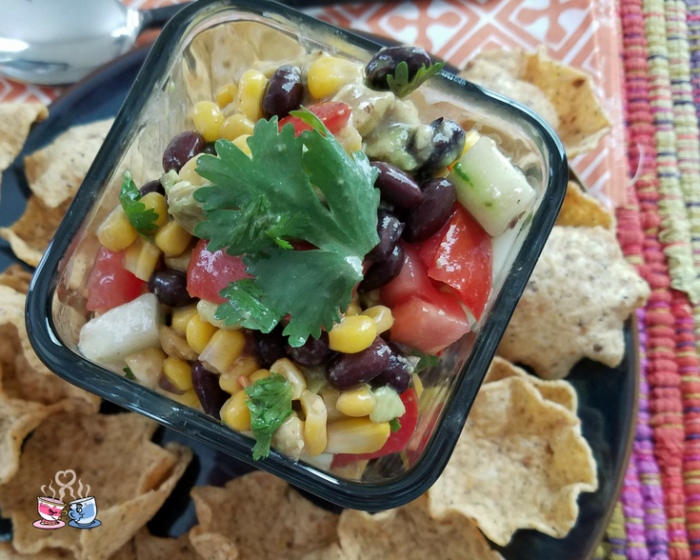 You can easily serve with baked tortilla chips or even crackers! 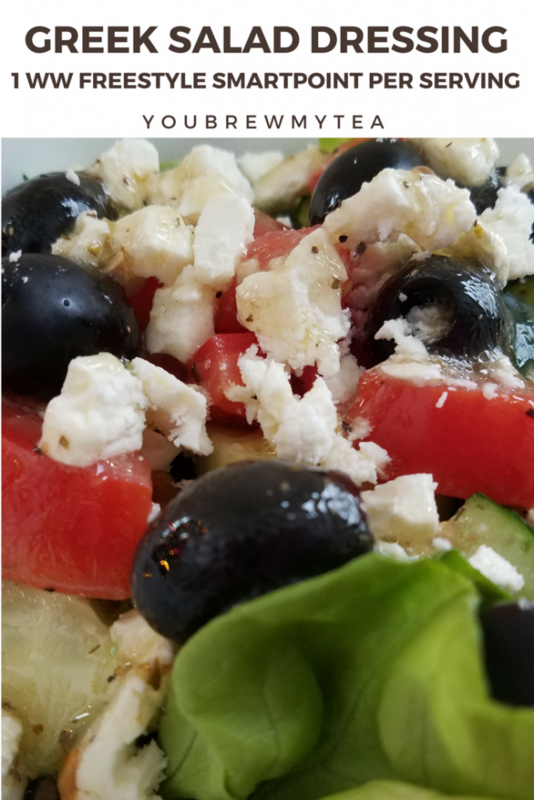 I figured this recipe using the recipe builder within the Weight Watchers dashboard of my own plan. 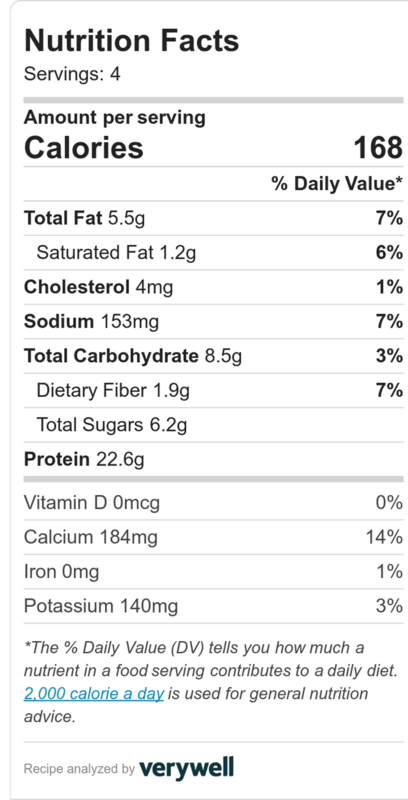 You can also calculate recipe SmartPoints using the manual Weight Watcher Calculator. For those who are looking for a lower cost way to work with a Weight Watchers system, you may be interested in using the app iTrackBites. Regardless of how you calculate points, this is a delicious and easy recipe to whip up for your friends and family! I never thought I would see the day that I loved kale or Brussels sprouts in anything. This Creamy Kale Salad with Brussels Sprouts is seriously amazing. 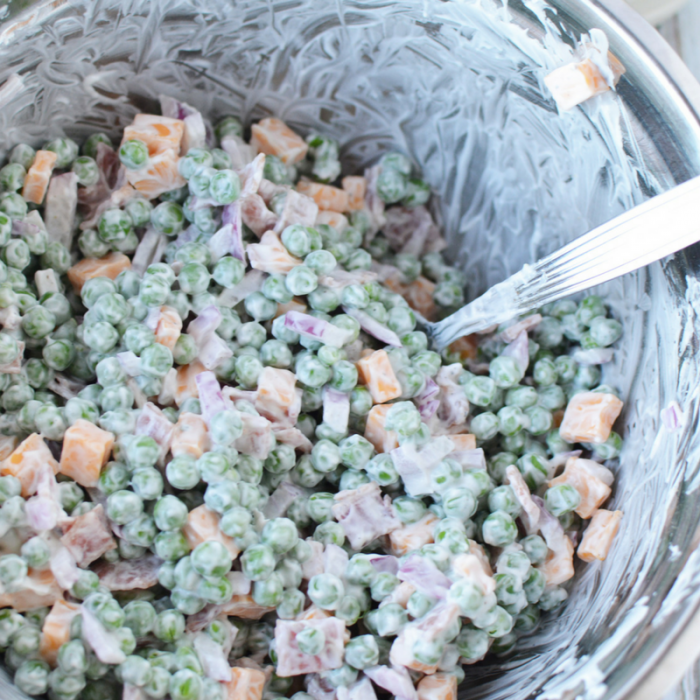 It is also a perfect side dish for summer cookouts! I’ve created a lightened up version that is similar to the one served by Cracker Barrel, and I am sure you’ll love it as much as I did! This post contains Amazon and Tupperware affiliate links. I may earn a commission from purchases made via these links. Have you avoided kale and brussels sprouts like I have? Well, wait no longer. 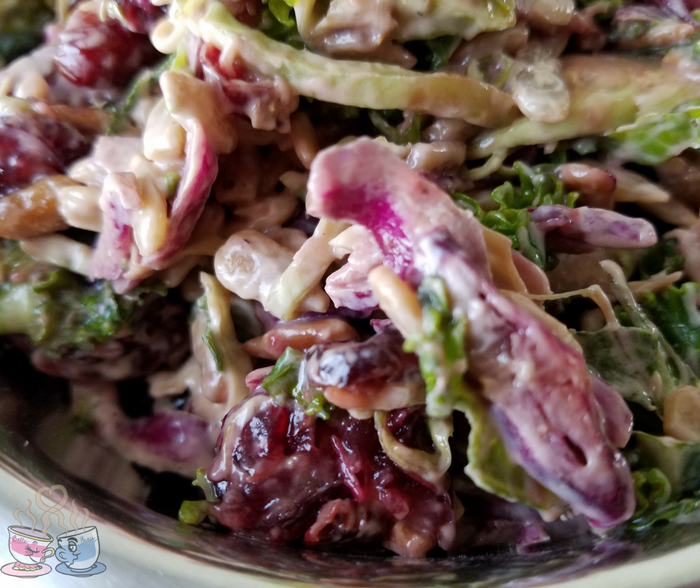 This slaw or salad recipe is just simply amazing! It is crunchy, a bit sweet, and a lot tangy. It packs a ton of nutrients and even more flavor. I love how simple it is to make, and you can customize if you prefer a different nut or want to avoid the added calories of the dried cranberries. After shredding Kale, Brussels Sprouts, and Red Cabbage mix together in a large bowl until well blended. I use my Tupperware Large Impressions Bowl for this since it doubles as a storage bowl. In a medium bowl, mix together mayonnaise and vinaigrette. Pour dressing over kale mixture and combine well. Mix in sunflower seeds and dried cranberries until just combined. After shredding Kale, Brussels Sprouts, and Red Cabbage mix together in a large bowl until well blended. While this is a bit high in points for a simple side dish, it can easily be an entire meal. 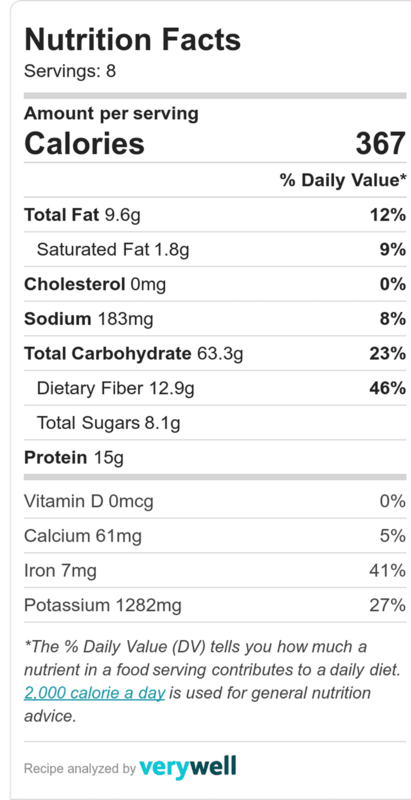 It has tons of protein, vitamins, and delicious flavor. A serving of this with a side of grilled shrimp, grilled chicken or a grilled pork chop would be a great meal that is satisfying. I calculated this recipe using the Weight Watchers SmartPoints calculator within my account. You can also use the Weight Watchers SmartPoints Calculator without having a Weight Watchers account. Let’s just say, I have been skeptical about kale. I just didn’t enjoy the flavor. So, I have worked hard to find a way to make it appetizing, because I knew it was beneficial to my health. This recipe definitely makes it easy to add to our menu plan a few times a month. These are just a few of the best things about eating this creamy kale salad. Not to mention the great benefits of Brussels sprouts! Make this on a regular basis, and feel no guilt about adding a cup to your lunch or dinner!